is a Mellon Postdoctoral Research Fellow at the department of gender, sexuality and women's studies at the University of Pennsylvania, and an affiliate of the Religious Literacy Project at Harvard Divinity School. She lives in Washington, DC. In recent decades, the world has been moved to help girls, especially girls in the global South. The Western campaigns and projects are legion: Girl Effect, Girl Up, Girl Rising, G(irls)20 Summit, Because I am a Girl, Let Girls Learn, Girl Declaration. The United Kingdom’s former prime minister, Gordon Brown, regularly writes about the potential of girls. The popular New York Times columnist Nicholas Kristof and Sheryl WuDunn wrote the book Half the Sky (2009) about the oppression of young women. It has led to the creation of an eponymous movement devoted to ‘turning oppression into opportunity’ for young women. This April, the World Bank pledged $2.5 billion dollars for investment in girls’ education and empowerment projects in Sub-Saharan Africa and South Asia. Are girls really the key to societal progress? Why has the international development field converged on the figure of the girl? What kind of girlhood is desired? Women and girls have frequently functioned as symbols for expressing hopes and fears, a powerful shorthand for the kind of society that people want, and what they think is important. Today, development campaigns often portray girls in the global South as not only threatened by disease, terrorism, patriarchy and poverty, but also as holding the potential to resolve these problems. This combination of promise and fragility makes girls irresistible targets for reform. Girls stand in not only for their own but also their family’s, nation’s and indeed the world’s progress. Generally, the international development community sees rather particular ways of being a girl as healthy and modern. In short, empowered, modern girlhoods are marked by individualism and entrepreneurship, consumerism, delayed marriage and motherhood, participation in the wage-labour market, and positive public expressions of sexuality. It’s a model of girlhood most associated with the white, middle-class experience. In contrast, girls living in poverty, in rural areas or in neighbourhoods rife with violence, crime or drugs find themselves classified as ‘at-risk’, ‘backward’ or ‘failed’ girls. So are girls who prioritise the wellbeing of their faith communities and families, and who value solidarity over individualism. But, all is not lost – education, empowerment and/or leadership projects posit that failed girls can be transformed into empowered, modern girls. My research in Pakistan, however, highlights women and girls for whom the white, Western liberal ideal of girlhood is neither possible nor desired. These girls viewed waged work not as a ‘choice’ or a ‘right’ but as a form of compulsion, primarily because the work opportunities available to them are often contingent and highly exploitative. They called for strengthening local systems of support, including faith-based governance bodies, councils and civil society organisations. The Western international development community typically deems such institutions as patriarchal, oppressive and unaware of ‘best practices’. However, my participants found these organisations supportive, especially when public/state-sponsored social services were absent. It is these local organisations that step in when development agencies leave or are unable to sustain projects. No one is suggesting that all local organisations are exemplars of gender justice – the jirga (village council) who ordered the murder this May of 16-year-old Ambreen in Abbottabad for helping her friend escape the village to marry is clearly not! What I am suggesting, however, is that there are many ways of being a girl. Surely, if girlhood is important, and girls are important, then girls and women in the global South also deserve a say in what kind of life they want, and how to live it. In practice, the attention on the figure of the girl makes social development appear as yet another individualised project. It avoids attention on the structures, systems and networks that actually produce the economic, social and political marginalisation of girls. For example, the search for new markets in Africa and Asia, corruption, colonial legacies, and the War on Terror all deepen poverty and displace hundreds of thousands, perhaps millions, of people. But the international community asks girls to take personal responsibility for their welfare. For instance, Nike Foundation’s campaign Girl Effect portrays girls as ‘co-creators of new solutions’ to poverty. 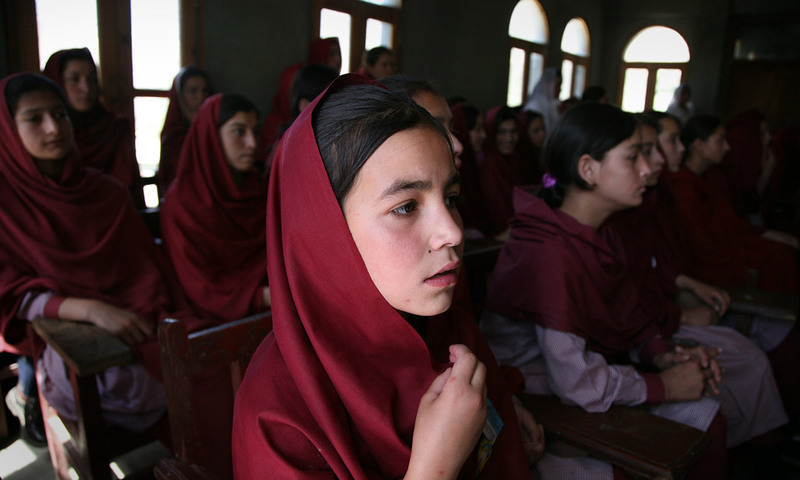 How are adolescent girls going to address state corruption and the War on Terror? No one is denying the agency of girls; indeed, I have documented such forms of resistance. However, we cannot expect girls to do this work in the absence of an authorising environment. Putting the onus of solving systemic problems such as poverty, terrorism and disease solely on girls, rather than calling for political solutions, is in reality contrary to the interest of girls. The convergence on the figure of the girl should be greeted with skepticism. These campaigns tend to render invisible some of the biggest problems afflicting girls in the global South. In the case of Pakistan, for instance, we can begin by acknowledging the political and economic conditions that make the lives of girls and their families precarious. This would include advocating for living wages rather than simply ‘jobs’. It would involve protesting the exploitation of the country’s natural resources and its people by transnational capital. It would call for legal measures to provide safe working environments, and holding the Pakistani state accountable for re-investing in the enervated social service sectors. Ending the rampant corruption among the political elite, as demonstrated by the recent charges of money-laundering against the prime minister Nawaz Sharif’s family, would also help girls because it would help Pakistan. Not coincidentally, it is Sharif’s daughter who is leading USAID’s Let Girls Learn project in the country. As long as attention remains on girls, instead of elite corruption and exploitation, the revenue streams for the Sharif family remain open. Effective feminism, feminism for the people instead of the elite one per cent, requires structural changes to political and financial institutions to improve the wellbeing of women and girls. We should not allow feminism to be reduced to window dressing that can be used to transform girls into flexible, low-paid and underemployed workers – the ‘human capital’ needed to reproduce current inequalities.